The LA Auto Show brought a ray of sunshine to the wintry outlook of the automotive world. The sunny show is gaining significance too. Amid the meltdown in the car industry, particularly in America, the car makers have put on a brave face at the annual LA Auto Show. Though there are few significant debuts from General Motors or the Chrysler Group, there's plenty of new metal for buyers, enthusiasts and environmentalists alike to get excited about. Saying that, those of green disposition will be torn between protesting at the presence of the likes of Bentley's extravagant new Azure T and hailing the introduction of an electric MINI. 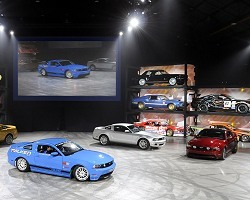 Hosting the world debut of such significant cars as the new Ford Mustang and Mazda3, the LA Show is undoubtedly gaining in prominence in comparison to January's Detroit event. That's certainly symbolic of the times. Below you'll find a stand-by-stand rundown. Individual articles with more detail and our extensive picture gallery from the show are linked to from the left-hand side. For full details on this year's LA Design Challenge, click here. Ever wish your three-tonne Bentley Azure convertible was a little more fun to drive? Well, Bentley has just the thing for you: it's called the Azure T and made its debut in LA this week. Glossing over the £230,000 purchase price, the T features a 500bhp, 737lb.ft, 6.75-litre, twin-turbo V8 and a Sport button. In global terms, there's nothing all-new on BMW's stand, though it did host the American debut of the awesome new 7 Series and another chance to see the mild hybrid version that is still labelled a concept. Of significance to the US market was the premiere of turbodiesel versions of the 3 Series and X5, signalling more acceptance for diesel power. Most of Ford's new exhibits in Los Angeles are targeted at the US market only, such as the large new Fusion saloon and its hybrid counterpart. However, Ford also unveiled a significantly updated Mustang, which will be of interest to car enthusiasts the world over. 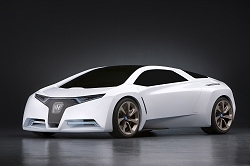 Honda revealed further details of its new Prius rival, the Insight, though the FC Sport Design Study stole the show with supercar looks, a three-seat layout and the fuel cell powertrain from Honda's FCX Clarity. Very cool. 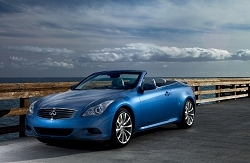 Infiniti had already announced its intentions to air its new G37 Convertible in LA and it'll be part of the line-up when Nissan's luxury brand hits UK shores in 2009. Should make a good alternative to BMW's 3 Series Convertible, though Infiniti needs more engine choices to really compete. 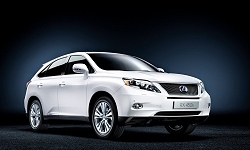 Although Lexus displayed its new RX SUV in LA in both hybrid and regular flavour, it looks like the UK and most of Europe will only receive the new RX 450h hybrid model. Along with a new look and upgraded interior, Lexus has eked more power out of the hybrid drive system, while reducing fuel consumption and emissions. 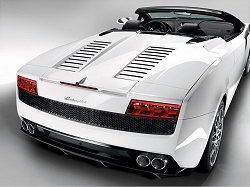 With Southern California one of Lamborghini's biggest markets in the world, it's hardly surprising the Italians chose the LA Show to give the new Spyder version of the Gallardo LP560-4 its world debut. What's not to like? It's got everything the fixed head version has, with the option to let everyone see who's driving. Finally some of Mazda's concept car cool is rubbing off on its showroom models. The new 3 made its debut in LA, albeit in four-door saloon format only. 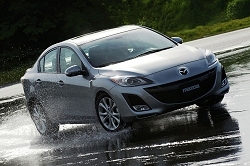 Sharing some detailing with the stylish Mazda6, the new 3 is available in the States with a 2.5-litre petrol engine. We doubt that'll make it over here, but an equally good-looking hatchback is due to be unveiled at the Bologna Show next month. One of the most interesting cars at the LA Auto Show this year is undoubtedly the electric version of the MINI, christened simply MINI E. The car in LA is no concept either, as it kick-starts a massive 500-car test fleet that will be leased to customers throughout the US and possibly in Europe too. 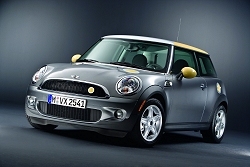 The MINI E actually outsprints the regular Cooper thanks to a 201bhp electric motor. 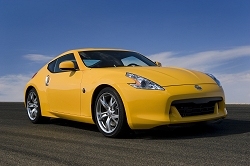 We're naturally drawn to the rather promising new 370Z on Nissan's stand in LA, but the launch of the third-generation Cube is just as significant, especially as the quirky five-door will go on sale in Europe later in 2009 with diesel and petrol engines and the option of shaggy pile carpet. 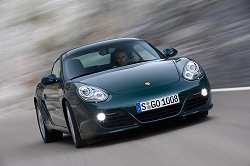 Porsche launched its facelifted Boxster and Cayman ranges at the Los Angeles show. As is Porsche's way, the styling is only subtly enhanced, with new lights and wheels the most obvious change, while all engines are upgraded and there's finally the option of a limited slip differential. We don't have the option of a Toyota Camry in Europe anymore, but it's one of the company's best sellers in the States, as is the hybrid version. A new concept revealed in LA mates the hybrid system to an engine running on compressed natural gas (CNG), which emits even less carbon dioxide than the petrol version. CNG is prevalent in some markets, though is unlikely to have a large impact with the price of oil currently dropping.